These are tied using splayed saddle hackle and other material in tail, double weed guards and rubber legs. My take on Larry Dahlberg's classic bug. A diver variant with Cohen's Frog Legs to offer bass and other predators a silhouette that they will recognize. 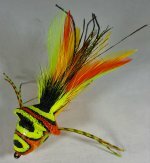 Deer Hair Popper with Cohen's Frog Legs to offer bass and other predators a silhouette that they will recognize. This is an articulated frog. This fly moves in the water without touching it.